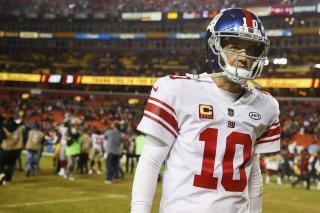 (Newser) – The big news from the NFL this week isn't about anthems or playoff races: It's the benching of Eli Manning. The 36-year-old QB has started 210 straight games for the New York Giants, but that streak dating back to 2004 ends on Sunday, reports ESPN. The reason is the team's awful 2-9 record, but the decision by coach Ben McAdoo is still a stunner. One high-profile reaction comes from actress Kate Mara, who tweeted "ELI" and a broken heart, per the Daily News. It's of note because Mara just happens to be the niece of Giants owner John Mara, who was presumably clued in on the decision. New York Post columnist Kevin Kernan complains that the Giants' transition from being "the classiest of franchises" to the "most clueless of franchises" is complete with the move he sees as disloyal and pointless. God I wish I could be there to laugh in Eli's face!